There is no turning back from the Abu Ghraib photo scandal. No matter how hard President Bush and his senior aides try, they won't be able to restore the last bit of the fig leaf that once covered their illegal invasion and occupation of Iraq. This is especially true, since the recent leaking of a legal brief prepared for Secretary of Defense Rumsfeld in March 2003 arguing that, since the President safeguards national security, any ban on torture, even under American law, could not be applied to "interrogation undertaken pursuant to the President's commander-in-chief authority." If the prisoner scandal was a moral tipping point -- the final step in transforming Iraq's foreign liberators into its oppressors -- it came in-between two military tipping points in the ongoing struggle between armed insurgents and the US-led occupation forces; in-between, that is, the battle for Falluja in the Sunni triangle and the battle for Najaf in the Shia heartland. In combination, these put George W. Bush in a listening mode during his meeting with French President Jacques Chirac in early June and led to a series of redrafts of the Anglo-American resolution on Iraq at the UN Security Council. The Bush administration's changed stance manifested itself in Iraq in the discarding of Ahmad Chalabi of the Iraqi National Congress, the poster boy of the neo-cons at the Pentagon, and the embracing of Iyad Alawi of the Iraqi National Accord, the darling of the State Department and the Central Intelligence Agency as well as British MI6. Only late in the day indeed did the Bush White House finally abandon its disastrous "year zero" strategy -- the disbanding of the Iraqi military, the security agencies, and the civil service coupled with a blanket de-Baathification policy (advocated by Chalabi and his neo-con cohorts) -- adopting instead the Alawi strategy of co-opting most of the elements of Saddam's regime minus its top leadership. And it did so not with a bang but with a whimper in Falluja where the only alternative was to reduce that city of 300,000 to rubble and create a political earthquake in the Middle East. Evidently, the Abu Ghraib moment marked a tipping point for public opinion on Iraq in the United States as well. In our Internet era, with the instant, worldwide transmission of the Abu Ghraib images, described by Rumsfeld as "blatantly sadistic, cruel, and inhumane," American voters were suddenly directly exposed to the dark side of the armed occupation of a racially, culturally, and historically different nation. Such turning points can also be found in the history of imperial Europe. In late 1950s Britain, popular support for the war in Kenya to crush the Mau Mau nationalist guerrilla struggle fell after the exposure of a fatal beating at the Hola detention camp. In retrospect, a leaked report from the International Committee of the Red Cross on torture in Algiers proved the tipping point in French public support for its war of occupation in Algeria. President Bush and British Prime Minister Tony Blair, trumpeting the passage of Security Council Resolution 1546 as a landmark achievement, have failed to address the crucial question: Will this resolution change the popular perception of Iraq as an occupied land? In the final analysis, public opinion in Iraq is sure to prove far more important than any Security Council resolution. The latest USA Today/ CNN poll of Iraqis shows that only 23%-27% have a favorable view of the U.S. or the UN. There was no ethnic or sectarian breakdown of these figures, but it is safe to assume that almost all the Kurds – one-sixth of the population -- who enjoyed autonomy under the Anglo-American air umbrella from 1991 to 2003, fall into the favorable category. This means that among Iraqi Arabs, only 7%-11% have a favorable view of the U.S. and the UN. It follows, then, that any Iraqi entity the U.S. and/or UN might put in place in Baghdad would lack credibility among Iraqis, no matter how much sovereignty was to be transferred to it by the Anglo-American occupiers with their 150,000 troops in place. And the actual interim government put in place was disappointing indeed. On one hand, President Bush and his National Security Adviser Condoleezza Rice assured us that their input into the creation of the new body was "zero." On the other hand, UN envoy Lakhdar Brahimi admitted publicly that his own promised authority in shaping the caretaker government had been "sharply limited" by American officials. After calling occupation administrator Paul Bremer "the dictator" of Iraq ("Nothing happens without his agreement in this country"), he said, "Whether Dr. Alawi was their choice, whether they maneuvered to get him in [the prime minister's] position -- you better ask them." On getting his Bush administration-backed assignment to name the interim government, Brahimi declared that he would choose those Iraqis who were honest, efficient, and nursed no political ambitions. Without much ado, however, the Americans overruled him because they feared that these technocrats might prove too independent. What Washington wanted was Iraqis who -- while willing to dabble in occasional criticism of the administration -- were in the final analysis beholden to it; and that is what Washington got at the cost of missing as yet another opportunity to persuade ordinary Iraqis that a dramatic change was in the offing on June 30. Of the top five positions, three went to erstwhile members of the US-appointed Iraqi Governing Council (IGC) -- Iyad Alawi, Ghazi Yawar and Ibrahim Jaafari -- and the remaining ones to the leaders of the Kurdish Democratic Party and the Patriotic Union of Kurdistan (PUK), allies of Washington since 1991. More specifically, the Bush administration placed two long-established cohorts in the key positions of executive prime minister (Iyad Alawi) and deputy Prime Minister in charge of national security (Braham Salih, former Prime Minster of the PUK-ruled Kurdistan). Lest we forget, Alawi's Iraqi National Accord (INA) was as prolific in supplying false information on Iraq's weapons of mass destruction as its rival Ahmad Chalabi's Iraqi National Congress. The INA was the source of the sensational claim that Iraq was capable of firing its weapons of mass destruction within 45 minutes of a Saddam order to do so. During the bargaining at the Security Council over the new interim administration's rights to its own security forces and its relationship with the US-led Multi-National Forces (MNF), the French insisted on an Iraqi veto over any large scale MNF offensives. By failing to support the French demand, Alawi proved his pro-American bona fides to top U.S. officials. A British-trained civil engineer, Salih has been Kurdistan's regional representative to Washington, and has cultivated good relations with both the State Department and the Pentagon. As Alawi's point man on national security, he will supervise the defense and interior ministries, and coordinate the rebuilding of the Iraqi security forces. Before taking up his new post of defense minister, Hazim Salaan Khuzaei, a Shia, was the American-appointed mayor of Diwaniya. In the wake of the failed 1991 Shia uprising in which he participated, he fled to Britain, where he became a property dealer. His lack of military experience suits the Americans. Falah al Naqib, a Sunni, who was appointed governor of Salaheddin province (capital, Tikrit) by the Coalition Provisional Authority, is equally close to the Americans. As was also true of the IGC, two-thirds of the 36-member interim government carry foreign passports, chiefly British and American. Of the remaining 12 who have only Iraqi passports, half are women. Remarkably, most of the former exiles of the IGC didn't even bring their families back to Iraq. Within days of his failure to secure the post of president, Adnan Pachachi typically returned to his base in Abu Dhabi with plans to spend the summer with his daughter in London. Now, the former exiles on the interim government are following the same IGC example and keeping their families abroad. This shows just how skin deep their attachment to Iraq is and how little faith they have in its future as a US-dominated "stable, democratic state." Like the IGC, the interim government lacks a minister for religious affairs, which makes Iraq the only Arab country without such a ministry -- a fact which undoubtedly has been noted disapprovingly by Grand Ayatollah Ali Sistani among others. From the public relations point of view, of course, it helps both the Bush administration and the interim government to resort to shadow-boxing over such symbolic issues as the custody of Saddam Hussein and who should in the future occupy the Republican Presidential Palace. Alawi's demand that Saddam must be handed over to the Iraqi government before June 30, and Yawar's insistence that the Coalition Provisional Authority should vacate the Republican Presidential Palace are meant to impress a skeptical Iraqi public that the new entity is different from its predecessor. The likelihood is, though, that it will be an example not of "old wine in a new bottle" but of "old wine in a well-used bottle." Dilip Hiro is based in London, writes regularly for the New York Times, the Observer, the Guardian, the Washington Post and the Nation magazine, and is a frequent commentator on CNN, BBC, and Sky TV. 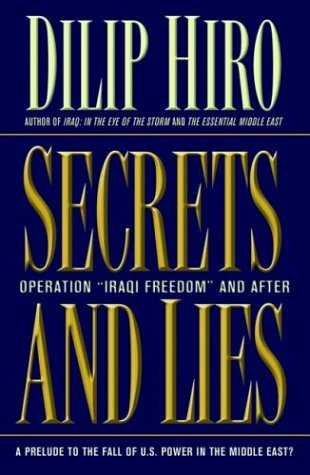 His latest book is Secrets and Lies: Operation “Iraqi Freedom” and After. (Nation Books, 2004). He is also the author of Iraq: In the Eye of the Storm. A version of this piece will appear in print in issue #728 of Middle East International. Copyright (C) 2004 Dilip Hiro.